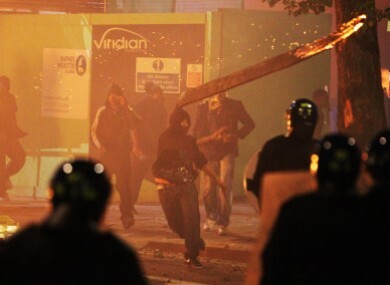 A rioter throws a burning wooden plank at police in Tottenham during Saturday night's riots. Further violence broke out in other areas of London last night. LONDON’S METROPOLITAN POLICE has blamed “copycat criminal activity” for a second night of violence across North London, as over 100 people were arrested in a night of widespread looting. Violence which had originally begun in Tottenham on Saturday last night spread to Enfield and Walthamstow, as well as Brixton in the south of the city, as over 35 police officers were injured in fresh rioting. Three officers were rushed to hospital after being hit by a “fast-moving vehicle” while they were in the process of making arrests in Waltham Forest, a Met Police statement said. Over 30 masked youths had earlier vandalised and looted a number of shops in the area, while in Brixton a major outlet of Footlocker was burned and ransacked. BBC journalist Paraic O’Brien told Five Live that violence from earlier in the night was being “replicated” at various flashpoints elsewhere in the city. “I’ve seen a striking number of mobile phone stockists that have been targeted,” he said. ”I’m standing outside [bicycle retailer] Halfords on the other side of the road and they’ve just smashed through the doors of Halfords. They’re taking bikes out the front entrance. Police commander Christine Jones said 16 people had been arrested on charges of burglary, theft, looting and violent disorder, while a further 17 people had been bailed. Jones said the police would “not tolerate this disgraceful violence”. Sky News had earlier broadcast reports that young people were joining the riots having seen news about them on the likes of Twitter. The original violence in Tottenham was provoked by the shooting dead of Mark Duggan, 29, a father of four, who was killed after an exchange of gunfire with police on Thursday. The tense scenes on Saturday night had followed an originally peaceful protest, as demonstrators sought “justice” for Duggan’s death. It was reported at the time that three bullets were exchanged between police and Duggan during Thursday’s shooting, with one of the bullets reportedly being fired from inside Duggan’s cab. The bullet fired at a police officer in that incident has been identified as a police-issue round by initial forensic inquiries, The Daily Telegraph reports this morning. The bullet was recovered from a handheld radio being held by one policeman; that officer had escaped injury when the bullet lodged itself in his radio. Email “Over 100 arrests in second night of London "copycat" riots”. Feedback on “Over 100 arrests in second night of London "copycat" riots”.